On Aug 18, a letter from Citizen of Pakistan Naeem Sadiq of Karachi (naeemsadiq @ gmail.com) was printed in this newspaper of record. The subject was a ‘Request for suo moto notice’ and it was an appeal to the chief justice of the Sindh High Court. As he writes: ‘Unless checked, this practice may soon extend to a declaration of religion and sect for other routing commercial transactions, such as buying a PIA ticket or obtaining a mobile telephone SIM.’ So, he has requested the chief justice of Sindh to ‘take suo moto notice and order the DHA to remove the requirement of religion and sect from its application forms and other related documents’. Absolutely correct — it is not the business of the DHA to delve into the religion and sect of people wishing to purchase plots which it has advertised for sale. In similar vein, Citizen Sadiq on July 25, 2009 addressed a letter to Chief Justice of Pakistan Iftikhar Chaudhry at Islamabad on the matter of compulsory zakat deductions by the banks of Pakistan, appealing to the Supreme Court in the public interest to take suo moto notice. His letter reads: ‘The Supreme Court of Pakistan in a landmark judgment on March 9, 1999 gave a ruling that members of all ‘fiqhs’ were entitled to exemption from compulsory deduction of zakat, and the federal government had no authority to reject the declaration of any Muslim seeking exemption from zakat, if it was made on a prescribed form. This judgment enables any Muslim to declare his/her ‘fiqh’ and thus seek exemption from compulsory deduction of zakat. De facto, it also recognises the right of individuals to practise their faith according to their own ‘fiqhs,’ and not be dictated by the government’s interpretation. ‘The historic judgment, while so well recognising the right of individuals in matters of their faith, made an irritating mess of how this right was to be practised. Firstly, it requires Muslims to declare their ‘fiqh.’ The great Prophet of Islam (PBUH) did not subscribe to any ‘sect’ or ‘fiqh.’ For his followers to be forced to invent, be branded and be divided by sects and ‘fiqhs’ is therefore an absolutely unethical and undesirable demand on the part of the government. ‘The second irritant relates to the requirement of making this declaration on a prescribed format, thus creating a serious bureaucratic and procedural difficulty for the ordinary citizens. They are required to fill a judicial stamped paper of Rs20 (available for Rs120), have it signed by a notary public and two witnesses before making a completely unnecessary declaration of their ‘fiqh.’ The form is also called CZ-50 affidavit. By July 31, Naeem received a letter from the Supreme Court registrar advising him that the chief justice had been pleased to accept the application and ordered that the matter (Suo Moto Case No.12 of 2009) be heard on Aug 10 at Islamabad, and he was required to appear in person. Two issues were raised at the hearing: (a) that the procedure for exemption from compulsory deduction of zakat was tedious, time-wasting, and cumbersome; and (b) that the state cannot compel its citizens to declare a specific ‘fiqh’ and thus be divided and boxed into one or the other schools of interpretation. Chief Justice Chaudhry sitting with Justices Jawwad Khawaja and Ijaz Ahmad heard the submission, agreed that it was a pro bono case, and ordered the State Bank and the federation of Pakistan to appear before the court at the next hearing (which is fixed for Oct 5) and explain as to why this procedure cannot be simplified and improved in the light of issues raised by the appellant. The state of Pakistan is intrusive when it comes to matters of religion. Why? 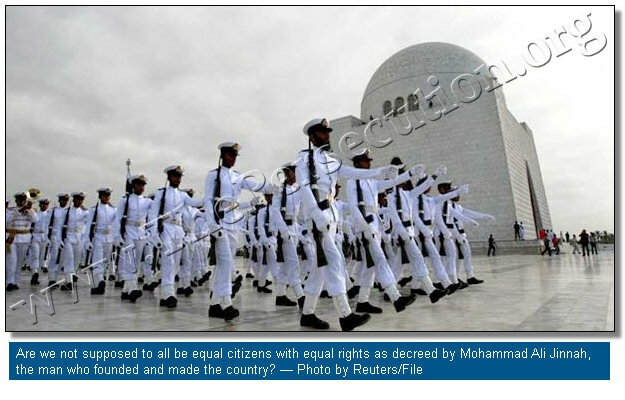 Are we not supposed to all be equal citizens with equal rights as decreed by Mohammad Ali Jinnah, the man who founded and made the country? According to the original constitution as promulgated at noon on Aug 14, 1973 by Zulfikar Ali Bhutto, we were equal citizens of the state, with equal rights. But this equality was done away with in 1974 by Bhutto’s second amendment to his constitution, bending to the obscurantists and bigots, and an entire community was shorn of its rights and declared a minority. Prior to this, in 1979 the same community was targeted by Ziaul Haq, general of the army and president of the republic, pious and God-fearing. He had decreed that all citizens, regardless of their religion, wishing to obtain a passport must sign a declaration that it is his/her belief that the Prophet of Islam is the final prophet and that any pretender that follows him is false. Such is the business of the state.